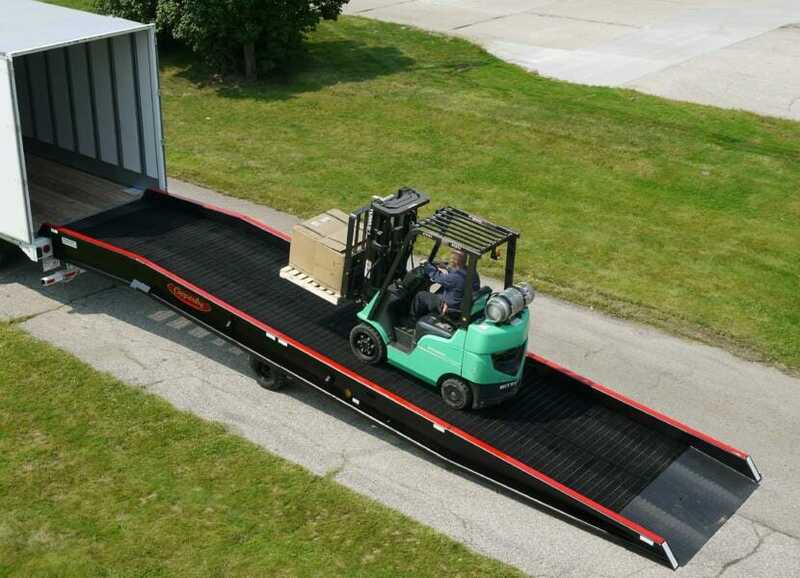 Yard ramps help crews load and unload from ground and docks with the use of a forklift, but they have their limits. Copperloy understands that shipping crews want and need faster, safer ways to load and unload trucks. Our newly launched advanced series of yard ramps are here to help meet these needs. Our re-engineered ramps are faster for two main reasons: (1) Their positioning capabilities and (2) Their one-cylinder hydraulic design. They can be positioned at the truck. Unlike other yard ramps, the re-engineered Copperloy yard ramp can be positioned at the truck. This positioning allows for crews to be ready to load up to two-and-a-half times faster than the average industry portable yard ramp. They use a one-cylinder hydraulic system design. Traditional ramps rely on a two-cylinder hydraulic system. Our re-engineered ramps use a one-cylinder design, however. This design means less pressure is needed to lift the ramp. Thus, ramp operation is easier and raise time is faster. What makes our yard ramps safer. Rise Evenly with Reduced Tipping. The one-cylinder design provides greater stability. In addition, the central location of the cylinder reduces the chance of tipping. Allow Easy Pump Access. The pump is located on the outside of the ramp frame, so loading crew members have easy access at all times. Handle Rugged Terrain. Our ramps have solid-filled pneumatic tires that can handle rugged terrain. As a result, the potential for punctures or air pressure problems is greatly minimized. Decrease the Chance of Disconnection. The positioning sleeve has three points of connection, which greatly reduces the likelihood it will disconnect during irregular maneuvers. Also, rotation occurs on the redesigned positioning sleeve instead of the ramp connection. This design reduces wear on the ramp structure, keeping our ramps in top form longer. Attach Securely to the Truck. We’ve included a 15-in lip and 8-ft safety chains to keep the mobile ramp secure to the truck. Prevent Accidental Runoff. Our ramps also feature 7-inch safety curbs to help prevent accidental runoff. We know a picture–or a video–is worth a thousand words. That’s why we recorded our tests and made them available for you to view. Copperloy performed timed raising and positioning studies of all our competitors’ loading ramps. Specifically, we compared ours to Bluff yard ramps, Vestil ramps, Discount Ramps, HandiRamp and Yard King. A comparison video showing the performance of Copperloy loading ramps. 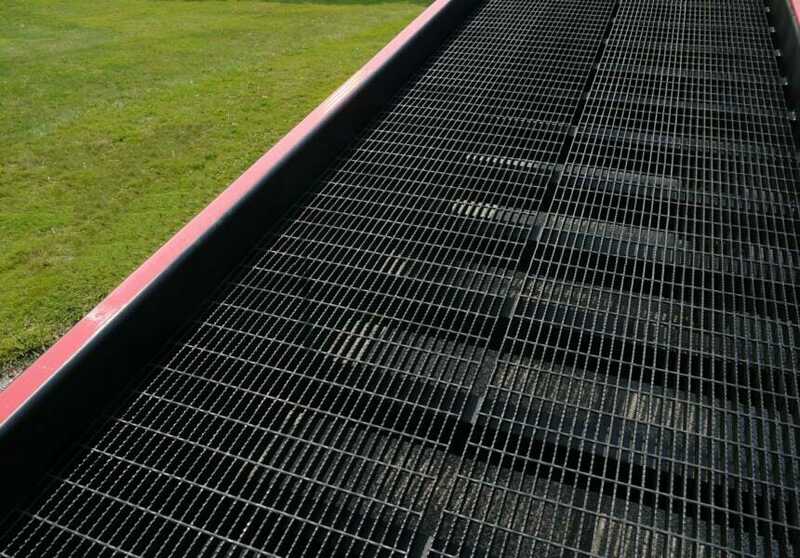 Contact Copperloy to find out more about the benefits of the redesigned yard ramp. We can help you find the solutions to your loading crew’s unique situation and needs.